The PFSense system that I have ran for years was starting to meet it’s end. The system hardware started to fail and the system would randomly reboot throughout the day which made accessing the Internet challenging so I guess it was time for me to invest in a new system. Originally I thought I would get one of those fanless embedded PFsense devices that start at $199 with only two NICs to replace my old system until a friend at work hip me to using an WatchGuard appliance that could be bought on ebay any where from $25 - $80 with 8+ network connections. HEY!!! -- I’m all about saving $$ like the next guy and I find a WatchGuard x700 on ebay that had the “Buy Now” option for $59 and free shipping and place the order for the new appliance that would replace my current PFSense system. I decided to document the steps and any lesson learned from my experience of installing PFSense on my newly acquired WatchGuard appliance. I hope this experience may be helpful to someone else that may be looking for an alternative to an old workstation or a fanless appliance. Installing PFSense 2.0 on a WatchGuard x700 Appliance. If you do a Google search of PFSense and WatchGuard, you will get thousand of hits related to the query. There are a few good sites out there that you can use when installing PFSense on a WatchGuard appliance such as the PFSense forums and I must credit the URL at the bottom of this post for actually having the information I required to successfully install PFSense 2.0 on my WatchGuard x700 appliance. 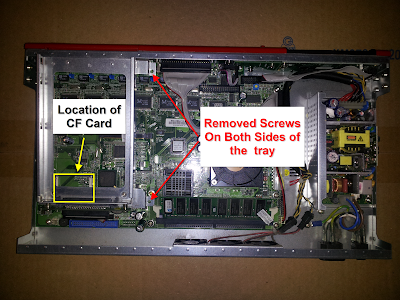 To access the CF memory card, I had to take out the hard drive tray which I was able to simply pull out of the appliance via the front hard drive access panel and remove the screw to the cover. Below is a picture of how the inside of my WatchGuard appliance looked after the cover was remove and also the CF Memory Card. Sorry, it wasn’t until I was already into performing my upgrade that I decide to document my experience. In the picture I have highlighted where the CF Memory card would be located. I also pointed out the location of the screws to remove the hard drive tray for easier access to the CF memory card. There were four screws that I had to remove from the hard drive tray holder, two on each side. You don't need a 51 in 1 card just a 1 in 1 that will read and write to your CF Memory Card. Note: The next steps were all done using a linux system. Just incase for some strange reason you want to go back to using the factory software that came with the firewall, you can backup the CF Memory card. 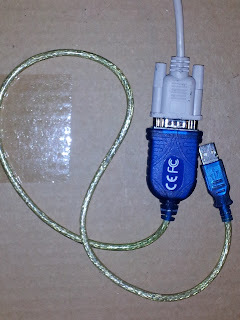 After connecting the card reader to your computer and inserting the CF Memory Card into the reader, open a terminal window to identify the CF Card connection. According to the output of the fdisk command, the card was located at “/dev/sdd” which contained 4 partitions listed as /dev/ssd1-4. Note: of=WatchGuardBackup.img will save the backup image to a file called WatchGuardBackup.img in the current location of the terminal window. Note: The next steps were all completed using a Linux system. The next step in getting PFSense to run on a WatchGuard appliance is to flash the BIOS to enable support for larger CF Memory Cards. The WatchGuard appliance currently will not boot from a CF card larger than 256MB and by flashing the BIOS with the X750EB6.BIN file, your WatchGuard appliance will now be able to support CF Memory Cards larger then 256MB. 2. Write FreeDOSBios.img image to CF Memory Card. 3. After writing the FreeDOSBios.img to your CF Memory Card, mount the CF memory card and copy the X750EB2.BIN file to the bios folder on the CF Card. After the file has successfully been copy to the “bios” folder, you can unmount the CF Card and install it back into the WatchGuard Appliance. 4. Connect your serial cable from your computer to the WatchGuard appliance. 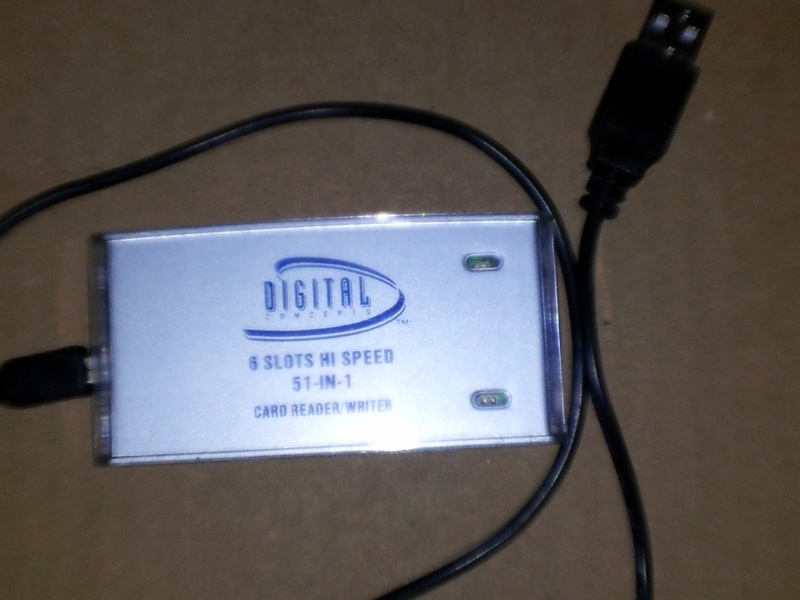 Once again, I get to use something that’s has been sitting in a box in my closet for years, my USB to Serial converter. With more than 10+ computers in my household, not one besides my old IBM PFSense system has a serial port. I believe serial ports are a things of the past. When I take my current PFSense system apart I have to make sure I save the serial card. I will place in the box next to the 5 ¼ and 3 ½ disk I have. You never know when you may need some ancient technology in the future LOL. After connecting your serial cable to your computer and the WatchGuard appliance, you want to start a terminal session on the serial cable. To ensure what device your serial cable is using on your system you can check the dmesg log. In a terminal window type the "dmesg" command. This should display the dmesg log file. On my system my the serial cable is using ttyUSB0. If you are unsure which device your serial cable may be using, disconnect the cable from your system view the dmesg log again to see if your can identify the cable being disconnected and then connect it back to your computer again while reviewing the dmesg log again. Once you are presented with the “C:\>” prompt, you are now ready to flash the BIOS with X750EB6.BIN file. Lesson Learned Time: Being a person very comfortable with using command line, there were some command line features unavailable in the "screen" terminal session to the serial console. Two such features that have caused me to restart this step many times was the missing tab to autocomplete your commands feature and the inability to use the backspace key. Neither was available while using the "screen" command to access the serial cable. Trying both features sent unrecognizable characters to the terminal window which made my session unresponsive. I was able to regain responsivness after shutdown the WatchGuard appliance. After you have successfully flashed the BIOS, you can power off the WatchGuard appliance and remove the CF card. Now it’s time to install PFSense on your CF memory card. 1. Download the PFSense nanobsd Image image for the size of your CF memory card. I downloaded the pfSense-2.0.1-RELEASE-4g-i386-nanobsd.img.gz to install on my 4 GB card. 5. Power on your WatchGuard Appliance and this time you should be presented with the PFSense initial setup Wizard. From this point on you would set up PFSense just like a regular installation. See How to Install PFSense and How to Configure PFSense. I want to thank the following sites with helping me to successfully install PFSense on my Watchguard appliance.